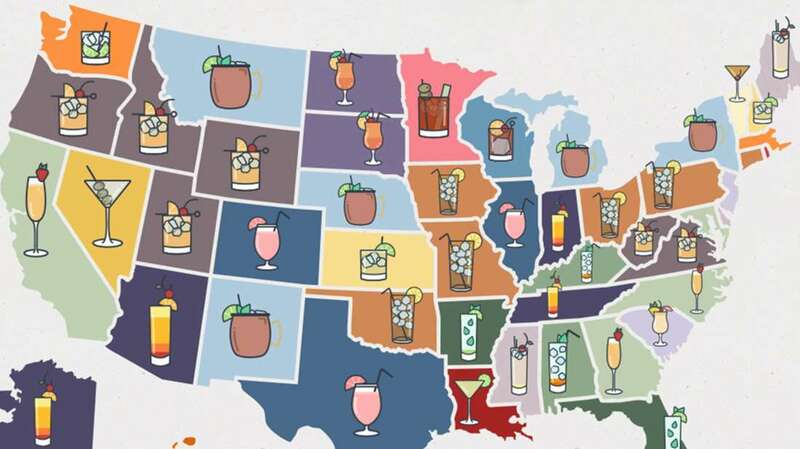 Let’s ice things up this week with a map of the 50 states most purchased cocktails! If you were to travel across the United States trying every one of their favorite drinks, you would come across quite a few of the same tastes. The most popular cocktails are the Whiskey Sour (Idaho, Oregon, Utah, Virginia, West Virginia, and Wyoming) and the Long Island Iced Tea (Connecticut, Iowa, Montana, Ohio, Oklahoma, and Pennsylvania). The whiskey sour is a mixed drink containing whiskey, lemon juice, sugar, and optionally, a dash of egg white while the Long Island Iced Tea is typically made with vodka, tequila, light rum, triple sec, gin, and a splash of cola, which gives the drink the same amber hue as its namesake. While some Americans are opting for the big stuff, others like to carry the tradition of a light ‘boozy brunch’ with Mimosas, Tequila Sunrises, or Bloody Marys. The original Tequila Sunrise originated in Arizona, where it’s still most popular now, in the 1930’s as a mix of tequila, crème de cassis, lime juice and soda water. Nowadays, the Tequila Sunrise is a cocktail made of tequila, orange juice, and grenadine syrup. Kentucky shows their Mint Julep pride each year with almost 120,000 drinks served over the two-day period of Kentucky Derby weekend at Churchill Downs Racetrack. It is illegal in some states to transport alcohol across state lines because of the different tax deductions. In the past, state troopers have been known to sit on the edge of state lines and keep track of cars making short trips across each state.